Training a dog to ride an elephant turns out to be surprisingly easy. The dog is my miniature schnauzer, Elodie. The elephant? A bike – an Elephant Bike, to be precise. Recently, I moved from a small town in the Oxfordshire Cotswolds to somewhere bigger, less rural, and where a sizeable chunk of the local population cycle for everyday journeys. For five years, I’d lived a couple of minutes’ walk from the high street. If I was on the bike, it was to ride out into the countryside and back – a way of keeping fit, not a means of transport. As a non-driver, journeys further afield involved public transport – buses to and from Oxford, 15 miles to the south, or the ‘local’ station, five miles away. So the prospect of being somewhere a bike would be the sensible choice to get around thrilled me. I’d missed my two-wheeled London commute from years back, and after that when I lived on the edge of Oxford and rode everywhere. But there was no way I could use the Colnago as a daily ride, so I had to find a second, more practical bike, moreover one able to take my four-legged friend. 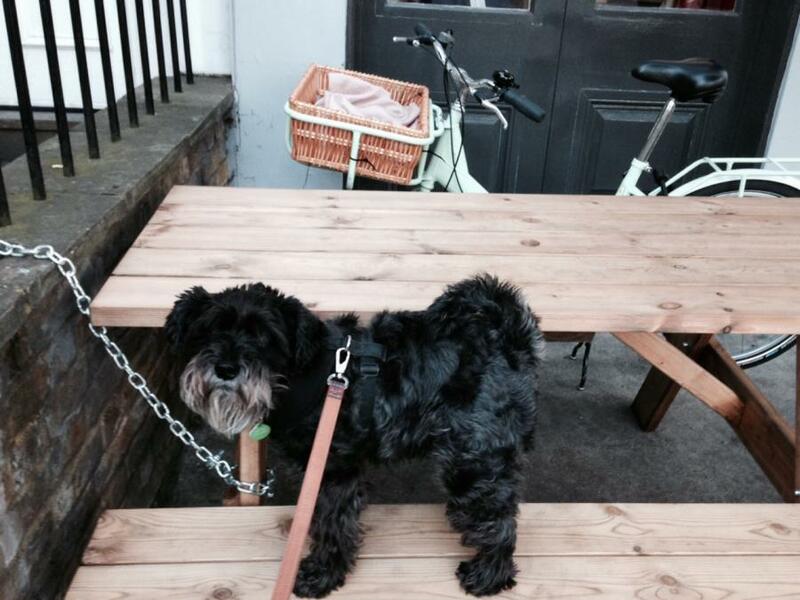 I’d worry later about how happy a seven-year-old pup who still intermittently yaps at anything with wheels but no engine – bikes, skateboards, mobility scooters – would be about it. I settled on a transportfiets from Dutch brand Batavus. But I hadn’t quite got round to buying it when, wandering past Micycle in Islington one Saturday, I spotted the Elephant Bike. The price tag and practicality of the bike alone were enough to sell it to me on the spot, but the back story also made it a purchase with no prospect of buyer’s remorse. It’s an ex-Royal Mail bike, 5,000 of which were donated to a charity, The Krizevac Project, which sends them to Malawi where they provide a vital form of transport. To offset the cost of shipping, the charity devised a buy one, give one scheme – so if you buy an Elephant Bike, one gets donated to Malawi. Moreover, they are refurbished in prisons in the Midlands, giving inmates the chance to earn a cycle mechanic qualification, a trade leading to less prospect of reoffending when they are released. Here's a video explaining the charity's work with the bikes. That’s two good causes right there, on e at home, the other abroad, and as I said, ones that make it a guilt-free buy in my book; it’s also pretty much a rebadged Pashley Pronto at less than half the price of a new one. And from the very first pedal stroke, I fell in love with it; it may weigh as much as a Boris Bike and likewise has three gears, but the ratio is more forgiving and perfect for anywhere I’ll ride it. It’s also, in the space of just a few days, got way more attention than any other bike I’ve ever owned. Even without the dog in the basket. People ranging from road cyclists to old ladies walking to the shops have stopped and asked me about it, and without exception they are fascinated by the story behind the brand. It even turned heads at the Pinarello Store in London earlier this week when I arrived at an event there and popped my head in the door to ask there was cycle parking nearby. There was just one question nagging away at the back of my mind, though – how would the pup take to it? 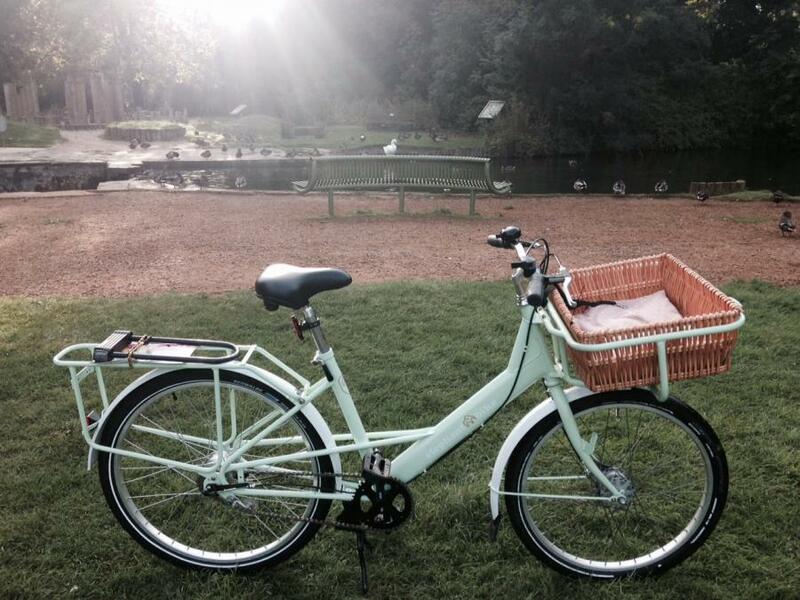 When I’d first ogled the bike at Micycle, I’d popped her into the shallow willow basket that replaces the black plastic tray in the Royal Mail version. She really wasn’t too happy about it, and that was even before I’d attempted to ride it with her. But a dog-loving friend said that with perseverance and bribery, she’d come round. On Sunday morning, two days after I picked the bike up, I decided to give it a go. I figured we’d spend a while getting her used to it, maybe go to the local park. 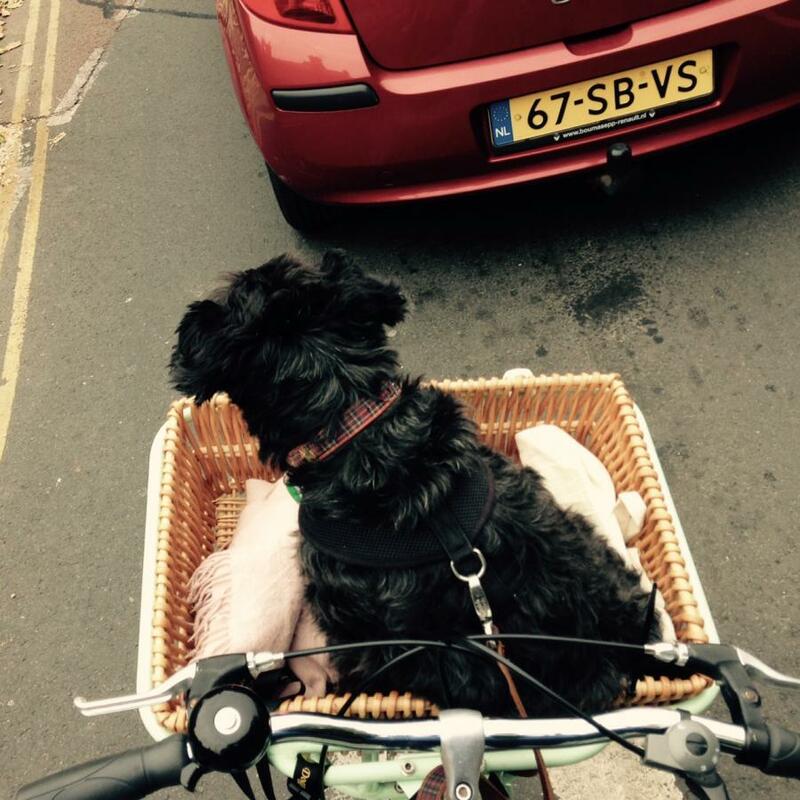 With her lead the right length that it can be wrapped round the metal basket carrier just so – not too tight, but not enough give she can jump out – we rode 20-odd miles and she loved every second. 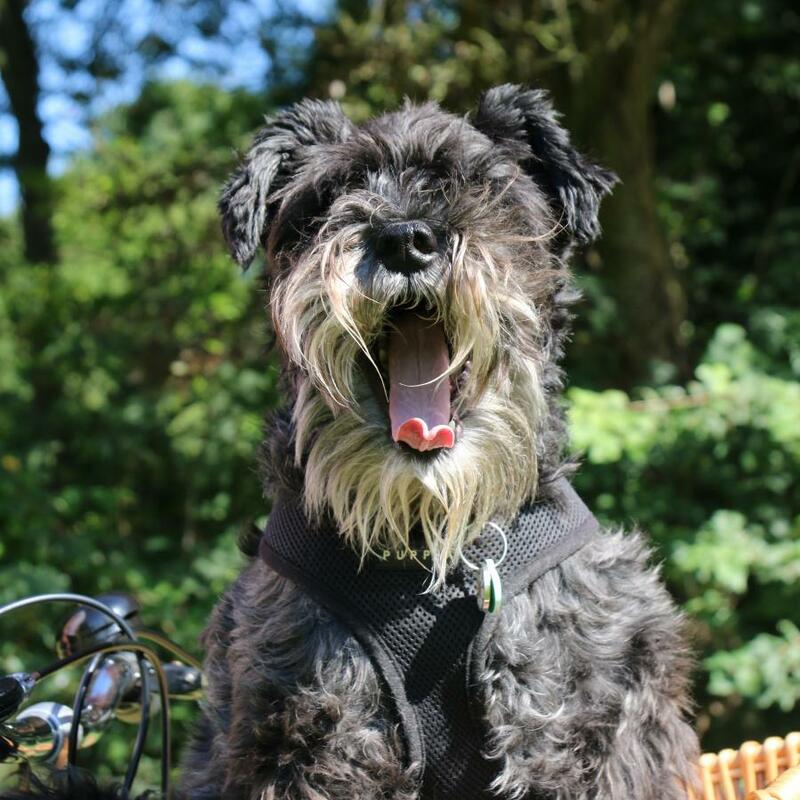 Treats were involved, sure, but since on her (infrequent) car journeys she loves sticking her head out of the window, or turning her beard into the wind while out walking, I was sure she'd eventually be fine with a bike ride. Sure, there are some issues. I probably need a rear facing mirror so I know when a cyclist is about to overtake us, and I am vigilant for joggers or other dogs being walked, which can both set her off. And of course, I also need to remember that she needs time being walked too so she can go about her business; when it comes to that, it’s definitely not about the bike. But I couldn’t be happier. Right now, I’d say this is the best purchase I have made, ever. Finally, if you’re wondering how they settled on the name Elephant Bike, here’s the explanation. Some of the first bikes sent out to Malawi ended up with rangers at a game reserve, who quickly discovered that elephants do not like moving objects that are coloured red. In fact, they’d charge at them. So they repainted the bikes green, a colour that enables them to blend more into the environment.